We have discussed the dangers of worshiping wealth, power, and pleasure as Satan, and the world, would have us do. We have also looked at how drinking from the cup of Christ gives us access to real wealth, true power, and deeply satisfying pleasure, but we haven’t really discussed why the cup of Christ is the only drink that will satisfy our minds, bodies, and souls. We haven’t really analyzed why Christ’s cup is right and Satan’s, and the world’s, chalices are wrong. 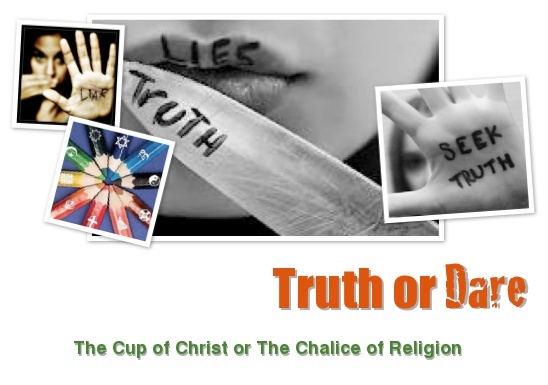 So, allow me to restate the premise of this series and to delve deeper into why the cup of Christ is the only choice for consuming and knowing the truth. In our introductory article, we stated that we would be examining the various chalices that mankind may choose to drink from while searching out eternal life. We noted that each of these chalices would be full of deadly lies, save for one. You see, truth (contrary to popular opinion) is not relative, but very definite. It’s in this one single cup of absolute truth that, if found, will lead humanity to abundant, and eternal, life. Christ’s cup is the vessel we have to drink from for this truth, and in this article we will divulge how you can know this is so. Mankind, since the fall, has been worshiping various deities in a whole variety of ways. This practice of worshiping an infinite higher power, or even just worshiping another person with a supreme importance, has always been apart of humanity. We call this practice of worship “religion.” Religion is what has developed from our primary reason for existence — worship. The fact that mankind, and all of creation, was made to glorify and worship our Creator (Colossians 1:16) is the reason religion is such a huge part of the human experience. Satan, knows this too. – Christianity — which makes up about thirty-three percent of the world’s population. – Islam — which makes up approximately twenty-one percent of the world’s population. – Hinduism — which makes up close to thirteen percent of the world’s population. 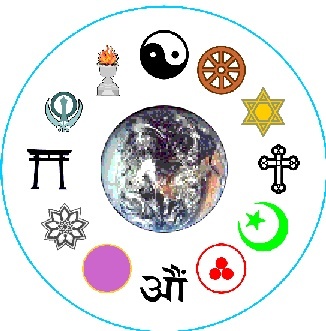 Hinduism actually comes in behind a slightly larger group of people identified as “non-religious,” but as we will be dealing with this “non-religious” group in another article (Article Six) I have chosen to exclude them for the time being. Hinduism, one of the oldest existing religious belief systems, was established in about 1300 B.C. God, or Brahman, to a Hindu is an eternal being; he is the one supreme and universal spirit who created all things. Brahman is infinite, devoid of form, impersonal, and everything is Brahman. For a Hindu to be able to approach the impersonal, divine creator, other forms of Brahman have been created. One such divine form of Brahman is Vishnu. Brahman’s avatar, Vishnu, comes to earth from time-to-time as a wise teacher. This human form of the divine brings to humanity enlightenment. A Hindu recognizes Buddha, Rama, Krishna, and even Jesus Christ as avatars of Brahman. You see, Hinduism accepts a broad belief system for reaching out to, and becoming one with, the divine. The holy writings of Hinduism teach of this broad road which can lead to humanity’s enlightenment and salvation. These holy writings are partly known as the <em>Vedas, and the Upanishads. The Vedas, and the Upanishads, are vast and consist of several documents that teach the Hindu about their rituals, mantras, history, philosophies, and spiritual disciplines. The Hindu’s religious teachings tell them that humanity’s goal in life is to realize its own connection to Brahman. This divine connection will allow mankind to detach from worldly desires and allow them to gain freedom from reincarnation. Reincarnation occurs when enlightenment and salvation are missed and the soul must remain on earth in other forms until enlightenment and salvation are achieved. With Hinduism you have no one founder, no one theological structure, and no central religious organization. Most Hindus are polytheists, worshiping many gods, but they are pantheists according to their doctrines. In other words Brahman, the “universal spirit,” manifests himself as many gods and in all things. Islam, is one of the newer religious belief systems. It has only been in existence since about 622 A.D., and the name “Islam” means “submission to Allah’s will.” Allah, is Islam’s supreme and eternal spirit. Allah is unimaginable and unapproachable; he is distinctively individual and cannot be revealed to humanity. Thus, Allah cannot be known personally by mankind. Abū al-Qāsim Muḥammad ibn ʿAbd Allāh ibn ʿAbd al-Muṭṭalib ibn Hāshim, also known as the prophet Muhammad, is credited as the founder of Islam. The prophet Muhammed, was a pious, political, and military leader who unified Arabia into a single religious belief system when he claimed to have received revelations from Allah. The prophet Muhammed recorded these revelations into a book, known as the Qur’an. The Qur’an, is the very words of Allah given to mankind through the prophet Muhammed. In these writings Muslims are commanded to spend their entire lives in “jihad.” Jihad is the struggle all Muslims are commanded to actively pursue, as they strive to live in the ways of Allah. This “faith by human deeds” is the only hope of salvation for Muslims, and consequently is also the reason they have no assurance of their salvation. There are two primary sects that comprise Islam, the Sunnis and the Shiites. The Sunnis live under a more liberal interpretation of the Qur’an, and believe that a “greater jihad” should be pursued by Muslims. They seek the greater struggles of life from within the human soul, and choose to eradicate evil from within themselves. The Shiites, however, are traditionally the more militant. These Muslims have interpreted jihad as being a literal “holy war.” A war in which every Muslim is called to destroy all of Allah’s enemies. Their goal is to establish Islamic theocracies throughout the world. Christianity, is the largest religious belief system in the world, today. It is also the oldest, and yet relatively one of the newer, religious belief systems in existence, too. How is that? I’ll explain. Christianity, which simply means “one who follows the teachings of Christ,” was recognized by the world as a religion in approximately the year 33 A.D., but these teachings of Christ, for which the Christian adheres to, are based upon the teachings of the Creator of heaven and earth, Yahweh, and are found in the writings of the Holy Bible, in both the Old and New Testaments. In Article One, of the series His Name Is . . . , we learned that Yahweh’s name means “I AM,” or the “Self-Existing One.” By declaring this name to Moses, in Exodus chapter three, verses thirteen and fourteen, God was establishing the fact that He was, and is, the always existent deity that created the heaven’s and the earth. Then in Article Seven, of the same series, we learned that Yahweh made all things by His Word — Davar — and that holy Word became a man, and lived, and died for man’s evil deeds (John 1:1-14). That man is Jesus Christ, and by this teaching Jesus, and Yahweh, are established to be the same God. Therefore, the teachings of Christ are not a newer religious belief system, but rather the original religious belief system. One that the Hebrews lost sight of, and moved away from (theologically) in about the year 200 B. C.
Christianity teaches that because mankind sinned against Yahweh, in the beginning (Genesis 3:1-19), they could no longer hope to approach the presence of their Creator for all of eternity (Romans 6:23a). Yahweh, out of the loving kindness of His divine character, shows grace to all of humanity by sending His incarnate Word, in human form, to be the sacrifice that would restore mankind to Himself (John 3:16-17). It’s this unique message of redemptive hope, through Christ’s sacrifice, that makes Christianity unlike any other religion. All other faiths teach that mankind can become righteous by his own efforts, but not Christianity (Romans 3:10). All a person must do to become a Christian (a true worshiper of Christ) is to simply confess Christ, and believe (Romans 10:9-10). 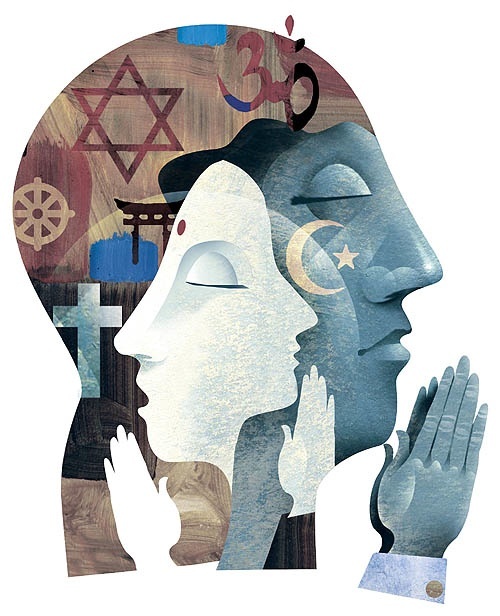 We have examined the basic religious belief systems connected to the three largest religious groups. In part two of our study, we will reveal the truths of Christ’s teachings and expose the false doctrines connected to the other religious belief systems. This entry was posted in Brahman, Buddha, Christianity, devil, God, Hinduism, Holy Bible, Islam, Jesus, Krishna, Muhammad, Rama, religion, truth, uncategorized and tagged Brahman, Buddha, Christianity, devil, God, Hinduism, Holy Bible, Islam, Jesus, Krishna, Muhammad, Rama, religion, truth, uncategorized by Jason Ministries. Bookmark the permalink. You are very welcome. 🙂 It’s our pleasure.